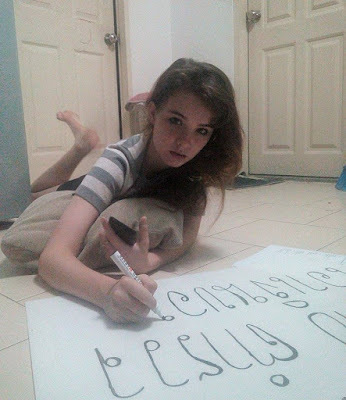 Sixteen-year-old Jessie Vard from Dublin whose father Colin, a former well known businessman and children’s author has been fighting the Thai authorities for over five years after being swindled by banks and thieves in uniforms and lawyers robes in Thailand, today challenges Prime Minister Prayuth Chan-ocha and questions whether he is serious about tacking corruption in Thailand. 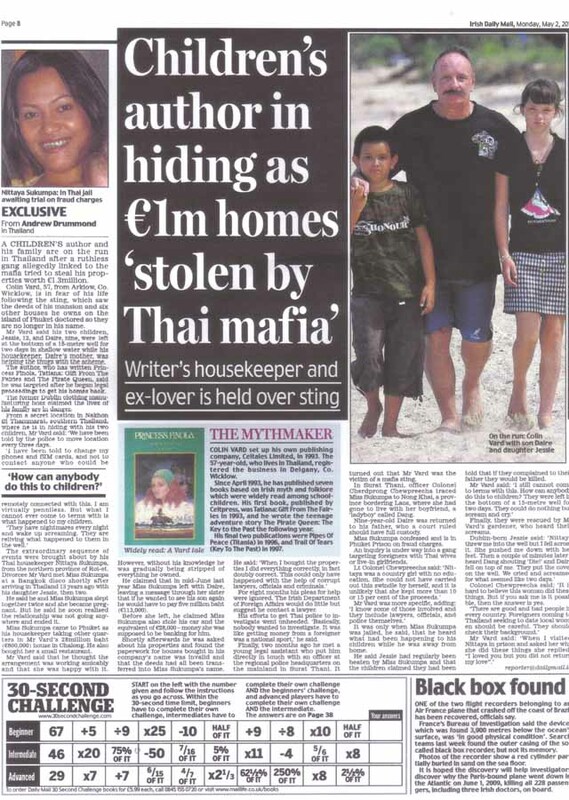 The case of her father is one of the worst numerous accounts of foreigners being swindled out of not just hundreds of thousands but of millions of pounds in Thailand while police, if they have not actually been involved themselves, refuse to take any action. Colin Vard was robbed of seven properties. Colin Vard’s story and his fight together with Jessie and son Daire was first revealed on this site and in the Irish Mail on Sunday demonstrates just how rotten the judicial system can be from bottom to top. They have been under witness protection for quite some time after being kidnapped – but witness protection in Thailand is not quite the same as in say the USA. (Eng / Thai)Justice for Jessie (Movie) …. The BBC has also been filming. Colin Vard says he will go to jail. If the current PM accepts one fraction of what has gone on here then it is complete indictment of the system. Hence he may not. Here’s the summary the family put out today. From the 05-06-10 to 17-04-15 the police in Phuket and Bangkok have steadfastly refused to allow my Dad file police reports against the criminals who stole his company, our family home and attempted to murder him. 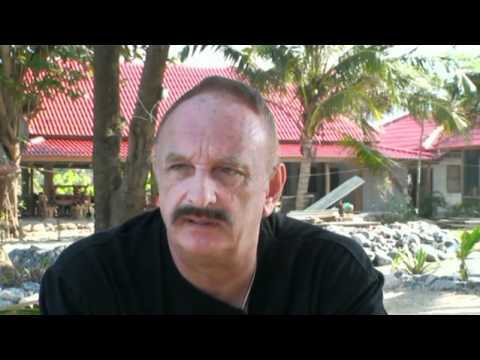 Due to the ongoing corruption, intimidation and threats to our lives by police officers, lawyers and illegal moneylenders in Phuket my brother and I appeal to you to intervene and right the wrongs that have ripped our family apart and shocked hundreds of thousands of people on social media not just in Thailand but all over the world. We have lost everything we own. We have nowhere to live and no money to fight the injustice and corruption in Phuket. Our past, present and future is in tatters. (ABOVE) A short video I put together at the time we broke this story – slightly dated. We made our home in Phuket and lived in accordance with the laws of the Kingdom. Laws intended to safeguard law-abiding citizens not support corruption. As far as we know the law does not differentiate between the rich and the poor. The rule of law and the reassurance it must provide has cruelly forsaken us. All we are asking is that the interpretation and implementation of the law in Phuket be apparent and transparent. Who are the greater criminals we ask? Those who stole from us or those who are protecting them? We only ask for justice and the law of the Kingdom to be upheld. We are children. Are we mistaken in thinking that the law can be bought and sold in Phuket? Children all over the world are taught in school that good always wins over evil? We have nothing now so I guess that the teachers are wrong and that crime pays in Phuket. Does that make Thailand evil? 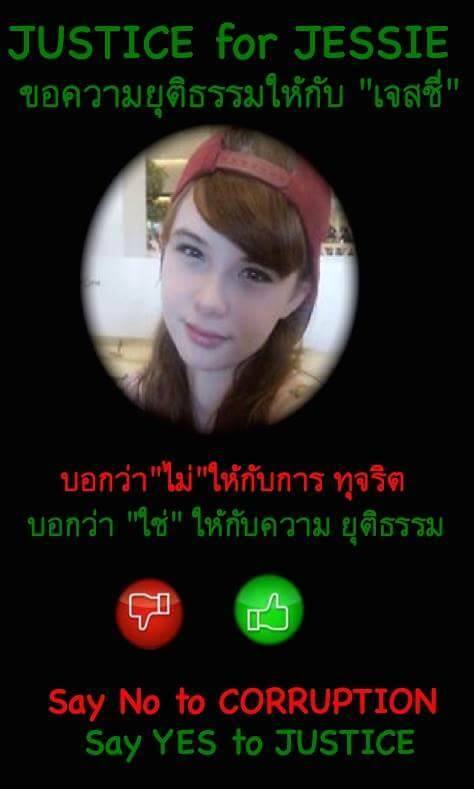 No because honest Thai people are tired of corruption. Thai’s young and old in their thousands have confided on my Justice for Jessie Facebook page that they loathe being associated with corruption and that silencing, obscuring and blocking the truth does not solve the problem it just encourages it. When I talk of criminals I include the Phuket police, lawyers and public officials involved in the corruption against my family. How else can they be described? In fact they are worse than common criminals because they are in positions of trust. They are employed to uphold the law and to identify and imprison criminals not protect them. When the law of the land breaks down so does society. We just want the criminals to know that while their threats and intimidation have indelibly scarred our childhood that our morals and resolve for justice is far greater than their corruption and we will not run away. We are young and truly hope and believe that justice is possible in Phuket and that all those who doubt it will be proven wrong by the actions taken by the National Council for Peace and Order. My Dad has been threatened, racially abused and forced to pay bribes to the police in Bangkok, and Phuket. 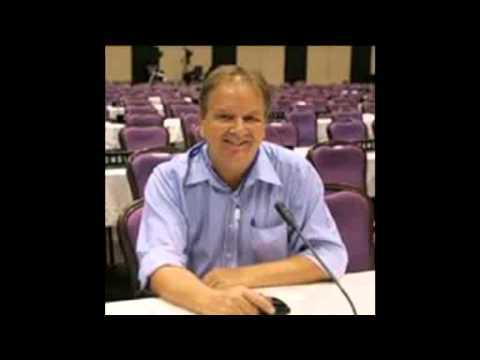 When my brother was kidnapped and a 5 million Baht ransom demanded for his safe return the police in Phuket and Bangkok refused to try and locate him. In fact the brutes found humor in our heartache. Good people in Thailand and the world over would be shocked and ashamed if they knew the truth of how my Dad, brother and I have been treated. 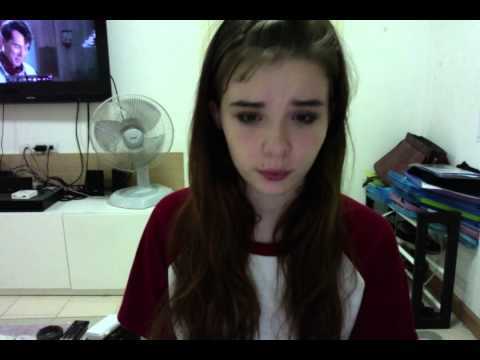 Eighteen months ago I was abducted and abused by a taxi driver in Bangkok. I was deeply traumatized. The police and court denied all my human rights. Indeed I was even forced to sit next to my abductor and abuser in open court and then was further humiliated by the judge who laughed at my victim impact statement? I felt totally degraded and worthless. On the 31-01-11 a Bangkok lawyer who claimed to work for the Thai government and the Royal Family was recommended to Dad after he had discovered that his Phuket lawyer had been conspiring with the local police and illegal moneylenders. For 3 years through fraudulence, treachery and trickery this Bangkok lawyer successfully obscured the fact that he too was working with the criminals in Phuket. This unscrupulous lawyer filed hopeless court submissions while extorting large sums of money from Dad through threats and deceit. The Bangkok lawyer broke almost every Lawyers Council regulation and should be severely punished for such unpardonable exploits. On the 18-05-11 Pol Maj Gen Dr. Prawut Thavornsiri in a Daily Mail news article syndicated around the world assured that our case would have priority and that the criminals involved be they police or lawyers would be interrogated and brought to justice immediately. His order was ignored by the police in Phuket. And four years on not one single corrupt lawyer or policeman has been questioned. On the 06-01-14 my Dad filed a complaint with the Royal Thai Police at their headquarters in Pathum Wan, Bangkok. The report detailed how the Chalong police had refused to allow Dad file criminal reports since the 05-06-10. 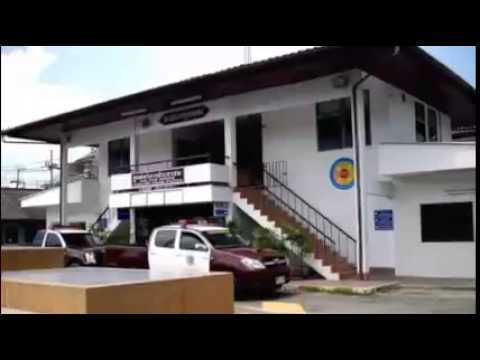 On the 10-03-14 the commander in Karon police station charged with investigating Dad’s claim joined with the Chalong and Phuket City police in stating that he too was not interested in helping a foreigner. 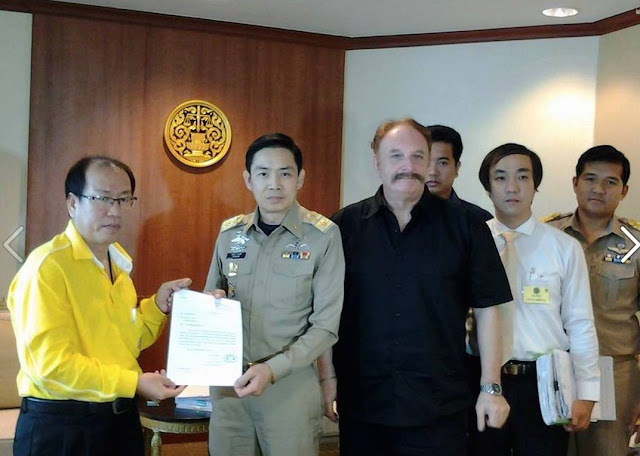 Four days later on the 14-03-14 Dad returned to the Royal Thai Police headquarters in Bangkok where he was advised to make the reports with the Crime Suppression Division in Ladphrao. From the 14-03-14 to the 04-02-15 Dad attended the Crime Suppression Division in Ladphrao five times and failed to file a single criminal report. Words from the Thai police are cheap. Actions cost a lot more. On the 25-10-14 my Dad travelled to Phuket alone and insisted on making criminal reports in Chalong police station. On the 21-01-15 three months later he found the reports that he had managed to file discarded on the floor in Phuket City police station. More alarming Dad discovered that vital evidence had been removed from the criminal reports rendering them useless. My Dad went immediately to the Phuket Chief of Police Major General Patchara Boonyasit who promised that an investigation would be carried out immediately and that my Dad would be contacted. Dad is still waiting. On the 20-03-15 and again on the 17-04-15 Dad returned to Phuket City police station this time with two officers from the Ministry of Justice who witnessed at first-hand how the Phuket City police obstructed my Dad from making criminal reports and how the existing reports filed on the 25-10-14 and the 21-01-15 had not been opened never mind investigated. Not a single criminal was called to give evidence. They also witnessed my dad failing yet again to file a criminal report about the 11 armed men who on the 23-07-10 forced their way into our house, held us hostage for 24 hours, threatened my dad’s life and extorted a large sum of money from him. The Phuket City police clearly do not see hostage taking, extortion and threats with deadly weapons as crimes. The senior officer from the Ministry of Justice was so angered and ashamed by what he witnessed in Phuket City police station that he immediately filed a report with the Ministry of Justice stating that my Dad could never hope to file criminal reports in Phuket. On the 11-02-15 Dad met again with Pol Maj Gen Dir. Prawut Thavornsiri in the Royal Thai police headquarters in Pathum Wan. Dad begged Dir. Prawut to intervene. At this time one Phuket civil court had ordered Dad pay 362,000 Baht ($12,000) compensation to the illegal moneylenders who stole his land while another had ordered him pay 15,000,000 Baht ($500,000) plus interest to the Thai bank that stole our family home? Worse still. 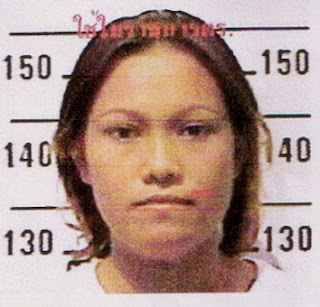 The Phuket criminal court had already tried, convicted and imprisoned the woman who admitted that she, the bank manager and the moneylenders had carried out the fraudulence against my Dad. These are the same people that the Phuket police have refused to file criminal reports against since 2010. How we ask can business and investment hope to flourish in Phuket under these troubling circumstances? 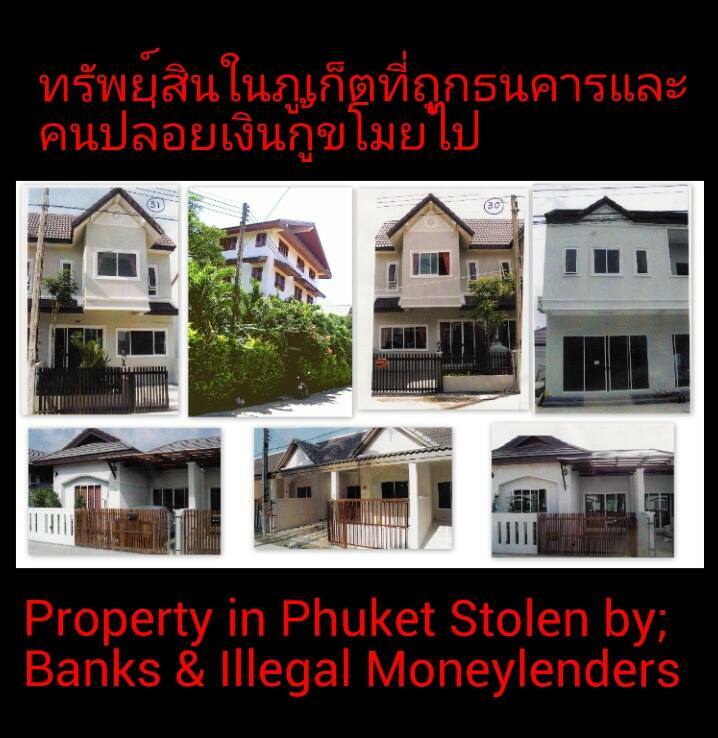 In Phuket the illegal moneylenders operate with impunity supported it seems by the entire legal system; Police who refuse to file criminal reports and lawyers, banks and land office officials who knowingly launder the stolen properties. The lawyer in my Dad’s case broke 8 of the 21 Lawyers Council clauses while the bank broke 102 sub-clauses of the Anti-Money laundering Acts of 1999, 2012 & 2013 while it’s manager was complicit in a failed abduction and murder attempt. Dir. Prawut contacted and charged Pol Maj Gen Apichat Suriboonya commander of Interpol with overseeing our cases. Sadly again no contact has been made. General Prayuth Chan-o-cha the corruption against my family started in 2010. This is 2015 and the criminals remain on the streets of Phuket carrying out their crimes protected by the Phuket police. We are children and don’t fully understand why? What we do know is after five years of death threats and 9 attempts on my Dad’s life and the Phuket civil courts seemingly making judgments at odds with the law and the criminal courts we have nowhere to live and no money. We ask you to please intervene. We want get on with our lives and ask that you to show that justice is part of the new Thailand under the watchful eye of the National Council for Peace and Order. Prime Minister; General Prayuth Chan-o-cha. The Commander of the Royal Thai Police; Pol Maj Gen Somyot Poonpanmoung. Commander of Interpol Thailand; Pol Maj Gen Apichat Suriboonya. 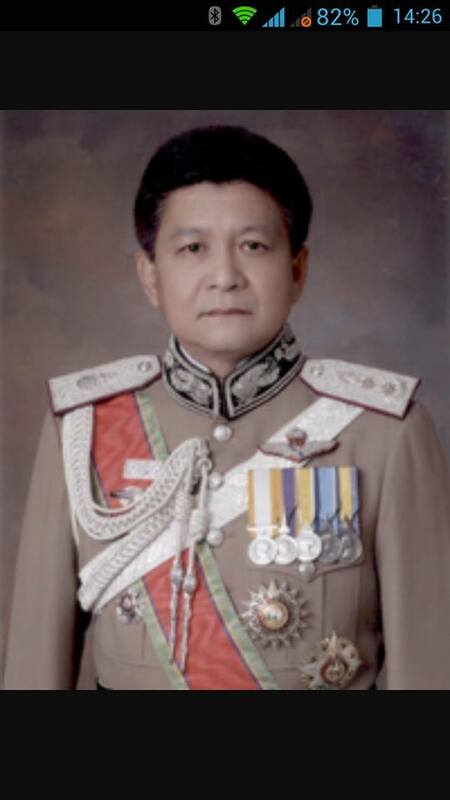 The Minister of Justice, Gen Paiboon Koomchaya. The Attorney General; Mr Trakul Winitnaiyapak. The Irish Ambassador; Mr. Brendan Rogers. President of the Lawyers Council of Thailand; Mr. Dej-Udom Krairit. Minister of Finance; Mr. Sommai Phasee. President Krung Thai Bank PCL; Mr. Worapak Thanyawong. Permanent Secretary; Mr. Rungson Sriworasat. Governor The Bank of Thailand; Mr. Prasarn Trairatvorakul. Chairman Securities & Exchange Commission; Mr. Atchaporn Jarujinda. Director General of the Revenue Department; Mr. Prasong Poontaneat.